Instagram can be incredibly helpful in growing your e-commerce business. And now that their ad platform is open to everyone, you can enjoy the successes that bigger companies have had with Instagram advertising, even if you only have a fraction of their budget — as long as you keep a few key factors in mind. Since Instagram is now owned by Facebook, all of this is run through the Facebook advertising interface, which means you’ll need a Facebook Page to run Instagram ads and the ads must abide by the Facebook advertising standards. 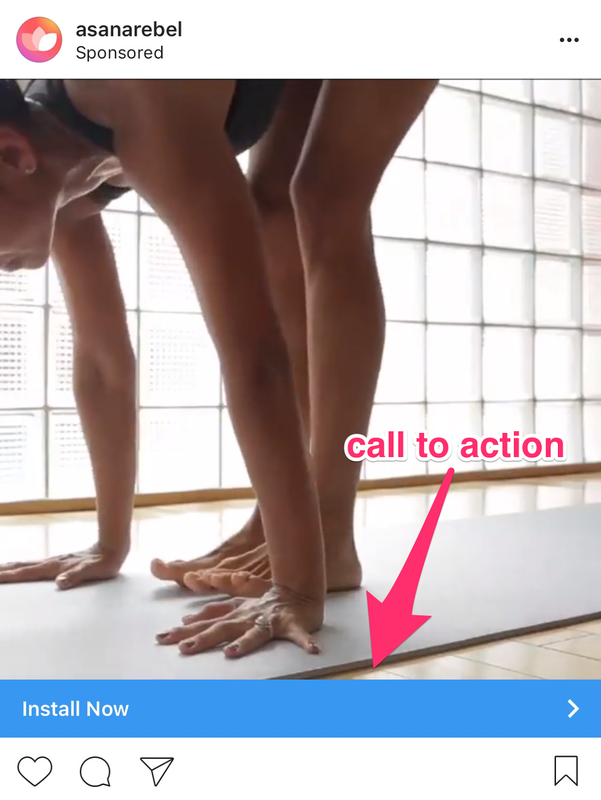 This AsanaRebel ad has an eye-catching video that makes you wish you were on the yoga mat and reminds you of the benefits yoga can give you, and a call to action that takes you straight to their app. The single biggest factor in making the most of your Instagram budget is going to be targeting the people most likely to buy. If you’re casting too wide of a net, you’re less likely to get conversions because the people clicking through won’t be your ideal customers. They’ll check out your product, not buy (or sign up for your email list), and then you’re out the cost of that click without getting any return on your investment. In addition to that, when you’re casting a wide net, you’re often competing with many other bidders for the same customers, which can drive up your advertising costs. Sounds great — but what specifically can you do to target the people most likely to buy? 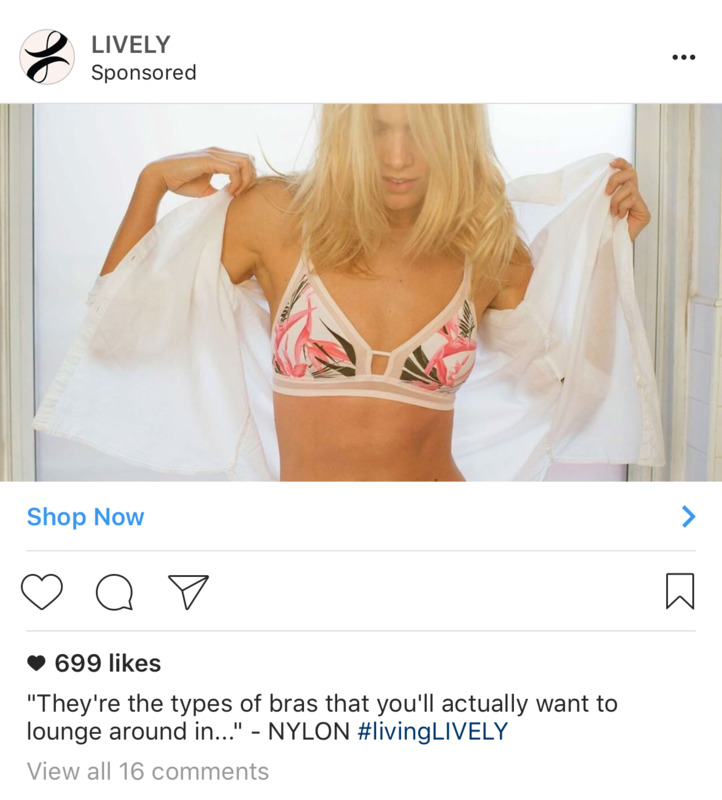 This Lively ad quotes a Nylon review that hits a common user pain point (uncomfortable bras), uses a branded hashtag, and showed up right before I made my first purchase from them — so they targeted their potential customers well! The first step in creating a well-targeted ad is to know who your current customers are, so you can target more people like them. Facebook offers robust targeting options, ranging from interests to age to location and more, but if you only have a vague idea what the demographics of your customer set look like, you aren’t going to get much mileage from those options. The good news is, the analytics tools you already have can tell you a lot who your visitors and customers are. If you use marketing channels like YouTube or Facebook, you can see those same demographics stats in the analytics tools for those channels. Your email marketing provider (MailChimp, Aweber, Convertkit, etc.) will also have analytics available as far as subscriber demographics. You should do this if: This is something every business owner should do regularly, regardless of where their business is at. Keeping a finger on the pulse of who your customer base is and how that customer base might be changing is vital to the success of your business (not just your Instagram ad campaigns!). Another idea is to send out a demographics survey to your customers. Using a tool like SurveyMonkey or Typeform, you can set up a survey asking your customers for more information about themselves. You can then use this information in all of your marketing efforts, but it’ll also come in handy in creating targeted Instagram ads. If several of your customers found out about you from a specific YouTube influencer, it makes sense to target people who like that influencer’s page on Facebook and/or follow them on Instagram, for example. It’s important to specifically survey customers here. You want to find out what your actual buyers have in common, not just people who hang around on your email list and social media channels. You’ll want to optimize for similarity (instead of optimizing for reach), since you’re on a budget. Optimizing for reach will get your ad in front of more people, but they might not be 100% the people you’re looking for, so it’s not quite as budget-effective. The ad platform will target customers who are like that group (hence the term Lookalike) but not necessarily in it. Your ad won’t be only sent to people who like your Facebook page, for example, but instead will be sent to groups of people that are demographically similar to those people. You should do this if: You have a healthy, engaged community on Instagram and/or Facebook, and you know that these channels are driving sales to your business. Remember: we’re pinpointing ad views towards people who are highly likely to turn into customers. In other words, if you have a large audience on Facebook but it doesn’t really drive sales for you, you don’t want to do a lookalike audience based off of your Facebook audience. Last but not least, you can use the aforementioned conversion pixels tool to target your ads to people who have visited your website before. The thinking behind this is that you’re targeting people who have visited your website but haven’t purchased your product(s) yet. If they visited but clicked away, they might just need a nudge to remember to buy the item (or be waiting for the right time to do so, and your ad will keep the product top of mind for them). You should do this if: You know (from, for example, looking at your Google analytics) that people tend to visit your site 3-5 times, and then buy. Or your product(s) are on the higher end of the price scale and tend to be something people need to mull over before they buy (bigger ticket items like a bed, for example). Keeping your product top of mind can help people move through the buyer journey and entice them into buying your product. Now, you know how to target the people most likely to buy. But are there any mistakes you could be making that are ruining your careful targeting selections? Don’t make it look like an ad. Instagram is a lifestyle-oriented platform — overly promotional posts don’t tend to do well. Instead of just having a photo of your product, have a photo of your product in use in everyday life. Let your viewers see how your product will come in handy in their life — make it look like a photo that one of your customers would snap and post on their Instagram profile. Don’t only post ads. Even if you’re running a few different advertising campaigns on Instagram, make sure that your brand account is posting normal posts at least once a day. 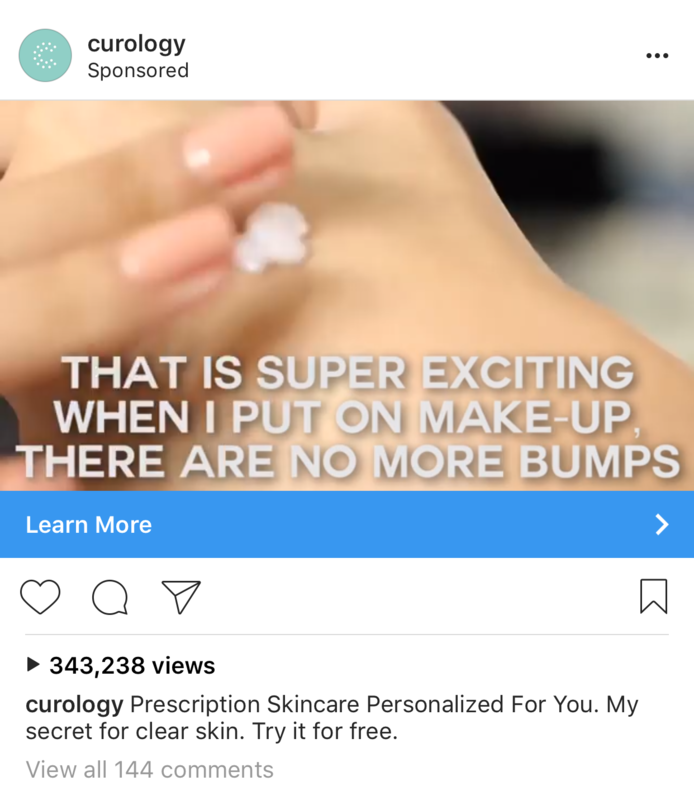 That way, when someone taps over to your profile from the ad, they’ll see a high-engagement profile, not a wasteland with two posts in the last month and a half. Set a budget ahead of time and make sure you stick to it. Don’t overspend on ads, especially not before you have a set strategy in place. You can read more about setting ad budgets to meet your goals here and here. Experiment with different formats. Try running a photo, carousel, and video ad with the same description and call to action, and see if one of them has a higher CTR (click through rate). In many cases, video is more engaging, but it could be the opposite for your product. You can also run the same video or image with different copy (like this blogger did) to A/B test your ad copy and see if one specific phrase is more effective than others. Consider using UGC content. “UGC” stands for user generated content and is simply a fancy way to say use photos or videos from your customers to advertise your product. Remember how Instagram is a lifestyle platform, and posts that look like they came from real customers are what you want to aim for? What better way to do that than to reach out to customers who posted mini-unboxing videos, videos or photos showing your product in action, or tutorials on how to use your product and ask them if you can use their images/videos in an advertising campaign? Make sure your site is mobile optimized, and consider sending viewers to a specific landing page. Many Instagram ads just send someone to the site’s homepage, but it makes more sense to send Instagram users to a specific landing page or even the specific product page of the product featured in the ad. That way, people are less likely to get distracted by other things on your site and click away or close the window. And that’s it — you’re now armed with the tools you need to tighten your audience targeting, maximize your budget, and avoid the common Instagram ad pitfalls. Get out there and grow your business! Michelle is a freelance writer living in Richmond, VA, with her Shiba Inu and cat named after the Hulk. When she's not writing about business, she can usually be found working on her novel series or other side projects, or training Brazilian jiu-jitsu.